Q: What is the #1 phrase you hear from ALL the top marketers? A: The money is in the list! Q: What is the fastest way to build a huge list of quality market-vested subscribers? Interested in a 7-Day Free Trial? Read more to see everything you get! Having a targeted subscriber list is essential to having a successful online marketing business. Normally, it can take WEEKS or even MONTHS to build list with only a few hundred subscribers. And the work involved, building squeeze pages and then driving traffic to the squeeze page takes time. Noticed the huge Increase in Giveaway Events that have sprung up over the last few year? Giveaway Events are a sure fire way to build a huge list in record time. Running your own Giveaway Event is time consuming and costly! It can take WEEKS, even MONTHS to be ready to launch your giveaway to the public. There are costs of a server, increasing your bandwidth to accommodate the large inflow of traffic to your domain, and promoting your event. You need to contact with gift contributors, design the sales pages, create templates... the list goes on and on. Be prepared to work long days and nights If you plan to run your own Giveaway from scratch. You have to remember the cost of your reputation in the eyes of other marketers who you've invited to participate in your event. One glitch creates an avalanche of problems. It could easily cost you the loyalty of thousands of subscribers. And you can be pretty sure your joint venture contributors will think twice about joining your next event, tarnishing your reputation! Maybe your already using a program that is the glitch, costing you time and causing aggrivation. So, how can you create and run giveaway events without the GLITCH? every aspect of the setup, launch, and follow through. 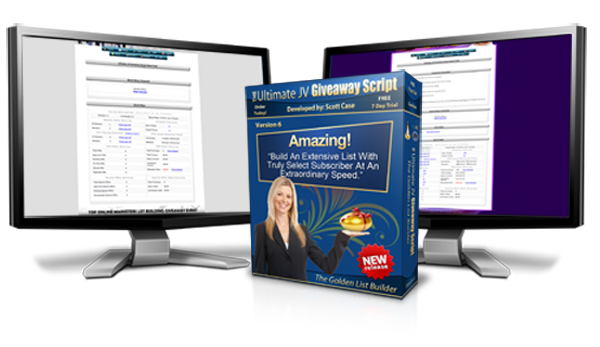 You have the opportunity to use one of the most highly recommended, user-friendly giveaway scripts in the internet marketing world. The Ultimate JV Giveaway Script is a custom one-of-a-kind program created by Giveaway Event Marketing Expert and programmer, Scott Case. You are easily guided through a process that would take years to master. Starting with the installation, Scott has developed an install wizard that prompts you and boasts an automatic server check. From there you customize the templates to your event design. If you have less experience, you'll find the layout only needs 2 or 3 changes before your done. Advanced users will find the freedom to spruce up your design and layout to your specifications. Consolidate your growing list by adding members to your 3rd party autoresponder. Affiliates will LOVE you for the instant PayPal payments. Of course you can use whatever payment method that suits your affiliates specific needs. The Ultimate JV Giveaway Script fully integrated helpdesk rescues you and your member base from getting spammed away or lost in a crowded email account. Your giveaway events can be closely monitored for questions and you can offer quick responses that are easy to track. Development and updates are constantly making this giveaway script one-of-a kind. good is on it's way when they see YOUR NAME. When it's this good it's golden! "Build a Quality List with Thousands of Market-Vested Subscribers In Record Time!" In development for over 8 years, this script has everything you need to run a successful giveaway event with confidence. Allows for a Single Install/Instance on a Single Domain Only. Allows for Unlimited Installs/Instances on a Single Domain. *The prices are the current support and product update renewal prices as of December 2017. The prices on this page are subject to change at any time.